Student Body President Emeritus Joseph Shepard says he was verbally attacked by Stacey Steffes-Sundquist, mother of Student Body President Paige Hungate following the Student Government end-of-year banquet Thursday night at the Beggs Ballroom in the Rhatigan Student Center. Student Body President Paige Hungate’s parents are subject of criminal investigation for battery and ‘fighting words’ against Student Body President Emeritus Joseph Shepard following an end-of-the-year SGA banquet. Student Body President Paige Hungate’s parents — who work at local high schools — are under criminal investigation for battery and anti-black, hate “fighting words” following an altercation at a student government banquet, according to police reports and multiple sources that attended the event. Rhatigan Student Center facilities workers contacted university police to report “an act of disturbance at the Rhatigan Student Center” at around 9:15 p.m. Thursday, immediately after the end-of-the-year banquet. Student Body President Emeritus Joseph Shepard, who was the second black student body president at WSU, gave a farewell speech at the banquet, which was attended by several members of the 59th and 60th Sessions of student government and their parents, administrators, and university staff. In his speech, Shepard said he acknowledged that Hungate was not his “first choice” for student body president but offered his support for her during her presidency. I’ve said this before, and I’ll say it again: Paige might not have been your number one pick — you all know she wasn’t mine either — but that is who the student body elected. Respect it, work with her, and stand by her in moments of difficulty because I’ll tell you right now, as a person who sat behind that desk, there will be moments where you’re smiling on the outside but torn up on the inside, and she will have her days. She will need more than just her loving parents and her family to be with her. She will need each and every one of you. So that is my plea for you tonight. If you truly care about this institution, if you care about the future of the institution, let’s do work. Let’s stop talking about it, and let’s be about the action. Sophomore Juan Garcia, who was in attendance photographing the event, said Shepard’s speech “elevate[d] the tension” in the room. Garcia said the speech was “politically charged” and left Hungate and her parents visibly upset. “You could tell by their faces, they were not having it,” Garcia said. Shepard said Hungate’s mother, Stacey Steffes-Sundquist, approached him after the speech because she had taken exception to his speech. He said they then moved the conversation outside of Beggs Ballroom, where the conversation escalated to an argument. Shepard said Steffes-Sundquist said his speech was “divisive” and an attack on her daughter. “She told me, ‘You’re the problem. Everything is about you. Everything is the Joseph and Taben show,’” Shepard said. Shepard said as Steffes-Sundquist left, she mumbled a racial slur — the n-word — directed at him. Multiple sources interviewed by The Sunflower that witnessed the altercation confirmed Steffes-Sundquist then directed a racial epithet toward Shepard. After the argument, Hungate’s father, Trent Hungate, “charged” Shepard, bumping Shepard’s mother, who is listed in the police report as a victim, in the shoulder, multiple witnesses said. “He had intent to physically harm me,” Shepard said of Trent Hungate. Steffes-Sundquist is an assistant principal at Wichita Northwest High School. Trent Hungate is a football coach at Kapaun Mount Carmel High School. In a statement to The Sunflower, Susan Arensman, news and media relations manager for Wichita Public Schools, said the district is aware of the incident. “To the extent that it impacts our district, we are following district protocol and investigating,” she said. Sophomore Amena Elamin said she witnessed the altercation between Trent Hungate and Shepard. “I had seen that Joseph was walking out. He was talking to Paige’s parents,” Elamin said. “Suddenly I see Paige’s dad charging after Joseph. Hungate did not respond to The Sunflower’s request for an interview about the altercation. 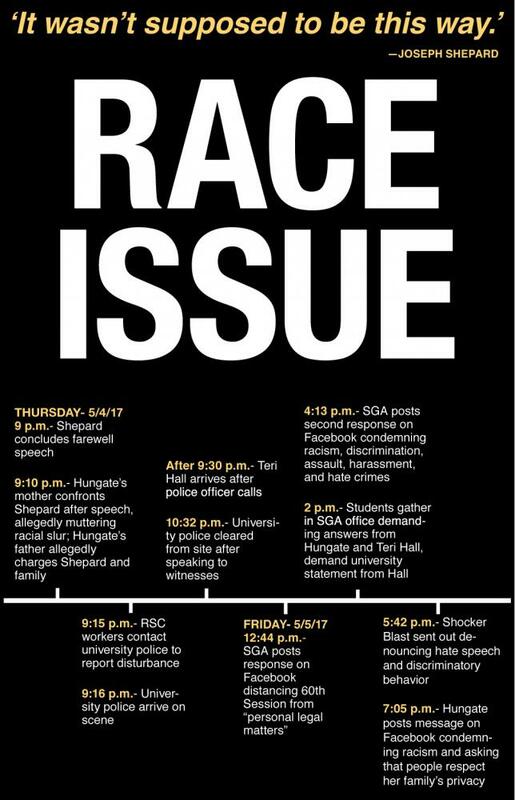 The WSU Student Government Association, through its Facebook page, released a statement Friday afternoon, distancing the organization from the situation. “The events relating to the parents of the incoming and outgoing Student Body Presidents are private matters,” the social media post said. “Making the Association involved would be outside of the Association’s functions. “With questions, comments, or concerns, feel free to reach out to members of the Association’s cabinet,” the statement said. At about 2 p.m. Friday, nearly 40 students went to the student government office in the RSC asking for answers from Hungate and Vice President for Student Affairs Teri Hall. “This has become a legal concern,” Hungate said, “a personal, private matter with my family, and I can’t really give any more detail than that. I really can’t. It’s becoming a legal concern with my family, that’s really all I can say. “I’m not going to incriminate my family. I’m not going to incriminate myself. I was not there last night when anything went down. I was not there. I do not know the facts,” Hungate said. Hall took over the meeting and answered questions from students. Hall went on to discuss improving the reporting system for incidents of hate crimes on campus. Students said they are growing increasingly frustrated with the university administration, including President John Bardo, who they said have continuously failed to address similar, concerns over treatment of minority students in the previous two years, including death threats, lack of support for the Black Lives Matter Resolution, and disparities in the way the university serves underrepresented groups. Students asked Hall whether she cared at all about growing tensions at the university, including those directed at Shepard. 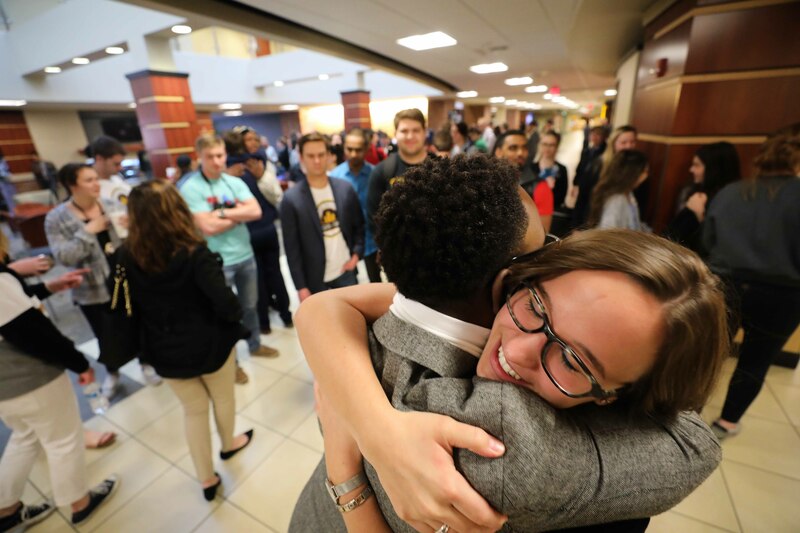 “We all here want a policy here saying Wichita State will not support or condone hate speech or racial slurs and I want it in writing and I want it fast,” said Tracia Banuelos, who ran against Hungate in the SGA elections. “What’s it going to take: One of us to get shot?” Banuelos said. There was no response to Banuelos’s question. Hall said she wanted to collect everyone’s email and schedule a meeting with everyone in attendance after finals. Nicole Byrne, Grant Cohen, and TJ Rigg contributed.